Last week, Apostle Michael Njoroge of the Fire Gospel ministries in Nairobi came under more fire when investigations revealed that he might have paid a prostitute to pretend that she had received healing at his church. Ms Esther Mwende claimed that she had been paid Sh40, 000 to give false testimony that she had suffered from a deformed mouth before being healed miraculously by Njoroge. As part of the extravaganza, the apostle claimed that the woman’s mouth was deformed because she had spoken ill of a man of God. A cloth concealed the alleged deformity as the woman wept bitterly. One Sunday later, she returned to the church to testify of her healing. “I have been healed and my mouth has become normal, praise be to God!” she told the congregation, who responded with a series of hearty ‘Amens’. The ‘man-of-God’ at the centre of the scandal, Apostle Michael Njoroge, has also claimed that he is able to curse those who oppose him. “I can pray for illness to befall those who are trying to taint my name, or their children,” he said, while praying for a young boy who had a swollen leg. The whole affair leaves a bad taste in the mouth. It’s disheartening that parishioners are still being led down the path to complete delusion like so many sheep to the slaughter. But what these so-called ‘watumishi’ are doing is criminal. It is manipulation of the worst kind. Were it not that it happens with such alarming regularity, it would be unimaginable that one human being could do that to another. I mean, who does that? What kind of ‘apostle’ drinks with a prostitute, sleeps with her and then pays her to fake an illness so that he can dupe his congregation? Does this man not fear God at all? Can the church ever come back from such reckless corruption? But this is the world we live in, I suppose. A world where the territory of evil has been enlarged to accommodate every wannabe pastor, priest and bishop. In response to the news of this latest church scandal, Reverend Father Daniel A. Owour, a man of the cloth himself, came out swinging for the gospel. “We should not ‘pooh pooh’ the message against the backdrop of the messenger. 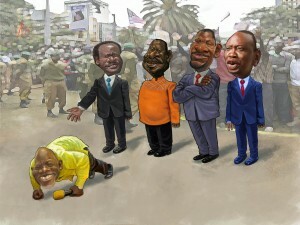 On moral responsibility, the buck stops with us all,” he wrote in a letter to the Daily Nation. This is a classic defence that stewards of the Christian faith can regurgitate on demand. Bishop David Oginde of Christ is the Answer Ministries also defended the faith when he spoke on NTV in Nairobi. Distinguishing the good news from the bearer, the Bishop said that the gospel is a living thing that is capable of standing its own ground. Indeed, many Christians will advise you not to mistake the faith for its followers. It is a standard apology that is rolled out whenever unscrupulous individuals use Christianity for their own personal gain. Where do we draw the line, though? It is one thing to put a price on prayers by charging congregants for miracles, but it is another to threaten to ‘pray against’ those who oppose you. In making that threat, Apostle Njoroge is confessing to a practice that is the hallmark of those who believe in black magic. Indeed, just the manipulation alone would qualify him as one who practices ‘witchcraft’. The word most often used for witchcraft in original scriptural texts is the Hebrew word ‘anan’, which means to cover or to act covertly. According to interpretations of scripture, the spirit of witchcraft imposes its will by manipulating others. It raises itself above the knowledge of the gospel and establishes its own authority at the expense of its victim. It can involve an unrighteous expression of legitimate authority. For instance, a pastor may use his or her authority to manipulate others in the body. Manipulating others does not automatically make an individual a ‘witch’, that is to say someone who derives their power from Satan. Nor does it mean the individual is a practitioner of magic. But it does suggest that a person is masking his or her true intention. In this case, one could conclude that the apostle’s intention was his own personal enrichment. I suppose I could go on a tangent about how we are being hurtled towards the end of the world in these perilous last days, which may very well be. But if we keep things simple, ultimately we are forced to admit that this man Njoroge is an entrepreneur who traded on the fear and gullibility in the market to make a quick buck. Hopefully, his customers have learned their lesson.